Hawaii's superstar soloist, John Cruz, has scheduled a series of concerts in Japan starting on Friday, September 2 in Yokohama at Thumbs Up. Catch the tour venue on his johncruz.com website. He'll be wrapping it up with a sunset performance at the Greenroom Camp Festival in Minamiboso on September 10, an eco-conscious event to promote saving Japan's beaches and protecting the environment. A songwriter and actor, Cruz is best known for his 1996 soulful hit "Island Style" which has become an anthem of Aloha throughout the islands and the world. In 2005, John added the Grammy Award to his list of honors. His original song "Jo Bo's Night" was featured on the compilation CD Slack Key Guitar Volume 2, which won the first Grammy ever awarded for Hawaiian music. The Oahu born singer has not forgotten his roots and is well known as a pro bono headliner at benefit concerts for numerous nonprofit groups. His first gig upon returning to the islands will be at the Kauai Lifeguard Association FIrst Wave Celebration on October 9, a fundraiser to buy jet skis and ATVs for local lifeguards who perform their rescues in some of the roughest waters in Hawaii. 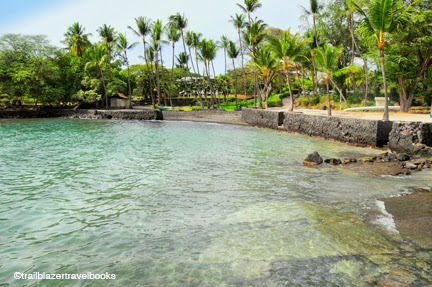 Keahou (KAY-a-ho) Bay is carved into the south end of the Kona Coast on the Big Island of Hawaii, for sure a place to see on a visit, and right up there as a place to stay—one of the sleeper destination resorts in Hawaii. 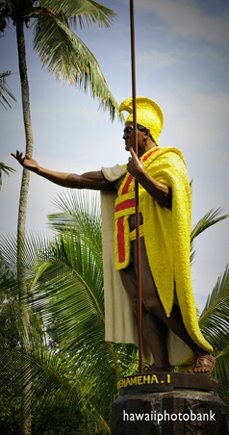 The bay is rich with history, as the birthplace of King Kamehameha III and also near where the final battle among Hawaiian warriors took place (at the Kuamo'o Battlefield), which ended the kapu system of punishments and sent Hawaii on the road to being a world-recognized sovereign nation. 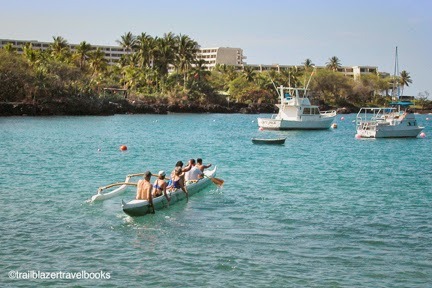 The bay has good snorkeling, and is also a departure point for tours that go around the point to the coral reefs at the Captain Cook Monument in Kealakekua Bay—one of the best dive spots in the Islands. Locals flock to Keauhou for canoeing and volleyball, and coastal paths invite hikers who want to watch wave action. Perched at one mouth of the bay is the Sheraton Keauhou Resort. Though not opulent by Hawaiian standards (which are Disneyesque) the resort has an awesome view deck over the Pacific, and has an out-of-the-way ambiance that is getting harder to find in Hawaii. You'll want to check this place out, if thinking about a high-end resort for your Big Island getaway. 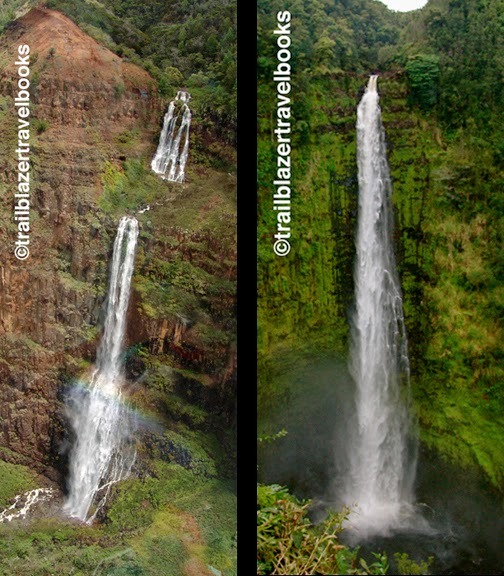 Contest: Where in Hawaii are these waterfalls? 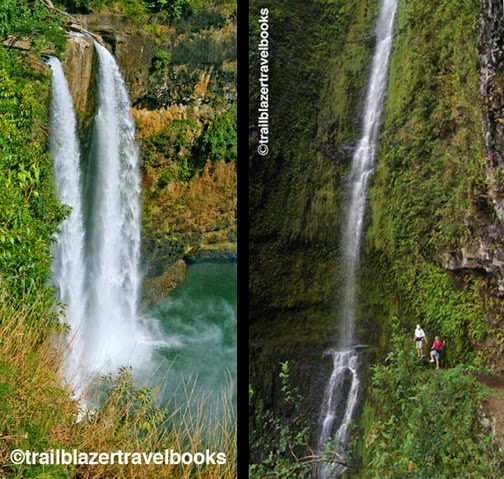 Name these waterfalls and win a free Trailblazer Travel Book of your choice. A winner will be awarded, even if we don't come up with someone who knows all five. 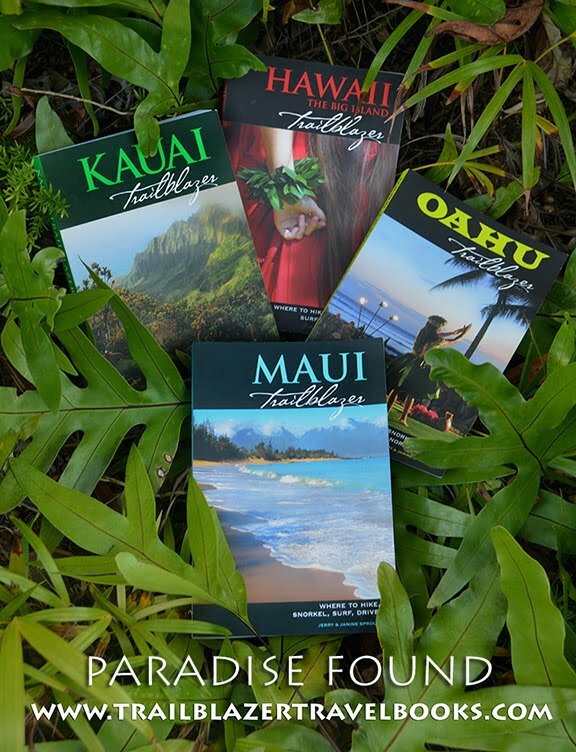 Hints: Three are on Kauai, one on Maui, and two are on the Big Island. One was closed due to an earthquake about five years ago. On falls was featured as the opening shot of a long-running weekly TV program. One falls is on private property, accessible with a hiking adventure company. And one falls is pictured here from a helicopter. 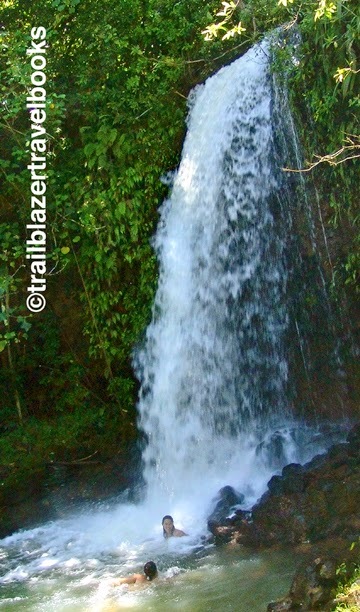 The new 2012 fifth edition of Kauai Trailbazer has gone digital, available via most electronic devices. You can access the Amazon.com Kindle version here. Access the B&N Nook version here. The new trade-paper version is also at Amazon, B&N.com, and retail stores. 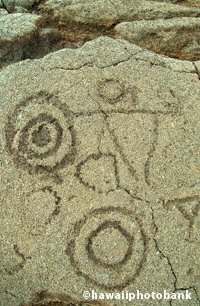 Groups and individuals can receive new copies at discount prices by going to Trailblazertravelbooks.com. 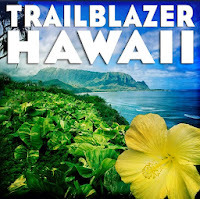 Kauai joins Hawaii the Big Island Trailblazer in the digital world. Next up: Maui Trailblazer and No Worries Hawaii. No Worries Paris—a photo-rich walking guide—will be out around Christmas, as will the ebook version of Golden Gate Trailblazer: Where to Hike, Bike, Walk in San Francisco and Marin. 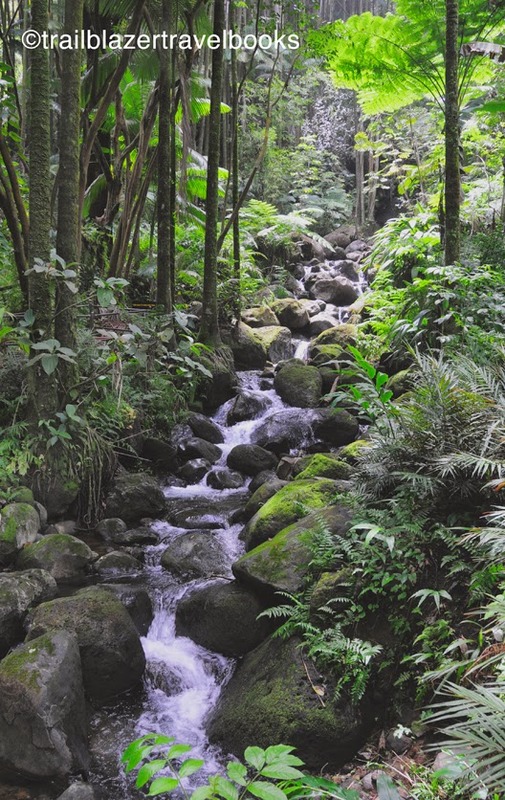 The experience begins at the Hawaii Tropical Botanical Garden—located just north of Hilo on the Big Island's Hamakua Coast—on a 500-foot long boardwalk that descends along a streamside Eden. 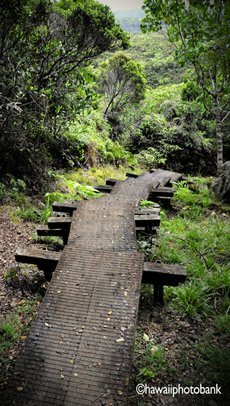 Though not huge by Hawaiian standards—about 40 acres that front two coves on a rugged coast—the gardens offer dozens of wandering paths that are punctuated with ideally situated benches. The longer you sit, the more you see, as layers of the tropical profusion emerge and envelop. The seeming chaos of greenery reveals itself, the master plan of dedicated botanists and gardeners who have tended thousands of plants, trees, and flowers for more than 3 decades at the nonprofit garden. Paths reach a waterfall, footbridges, a koi pond that Monet would love, and an aviary housing big squawking shamrock macaws. Other paths cross a public easement to coves (Turtle Bay and Onomea Bay) where waves do battle with tufts of lava reef. 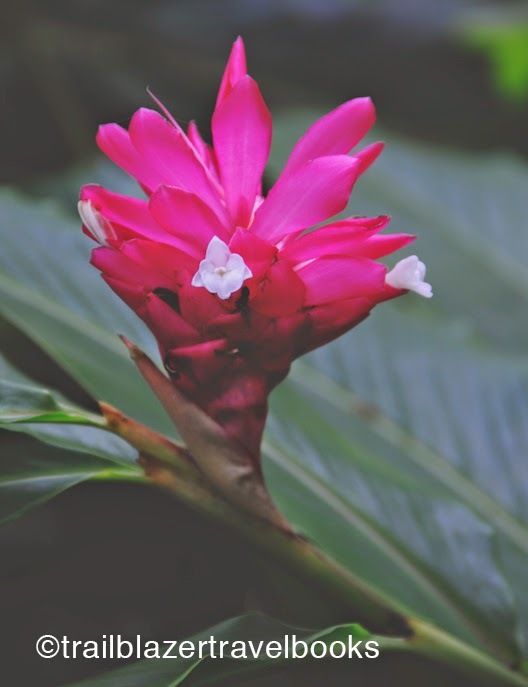 HTBG is one of dozens of tropical gardens in Hawaii, and not one of the four National Tropical Botanical Gardens in the state—but it stands shoulder-high among the elite. It's easy to miss. Take the Onomea Scenic Highway that veers from the lush Hamakua Highway and look for the garden offices after 1.75 miles. Hawaii the Big Island Trailblazer covers this coast on pages 169 through 176. 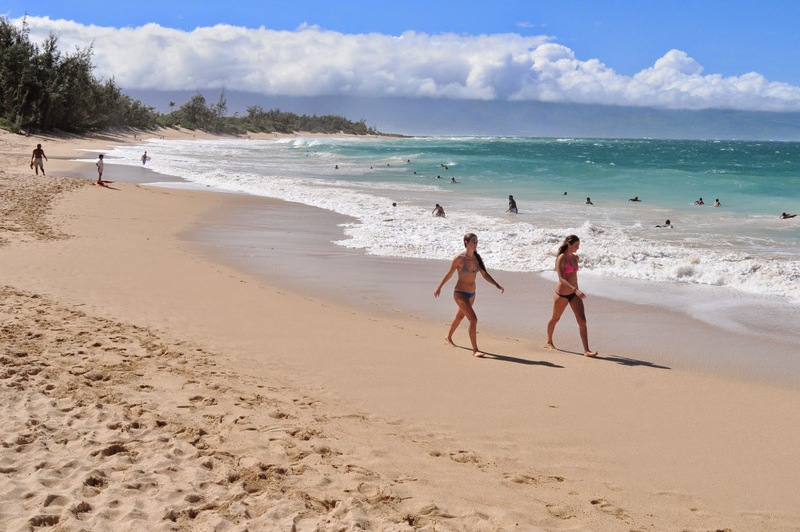 Head a couple miles north of Paia (the windsurfing capitol of the world) on Maui's east coast to find Baldwin Beach Park—where on most afternoons Everything Is Right With The World. Locals spill from the parking area onto the sands, and someone may be playing a slack-key guitar. Surfers and bodyboarders get thrown around in a foamy shore break. At the far end of the sand, mothers and kids roll around in a large reef-protected swimming oval called Baby Beach. If you feel like a walk, head either direction along the sands for a mile or two. One direction leads back to Paia's beach park, via secluded "State of Mind" Beach, a.k.a., Montana Beach. 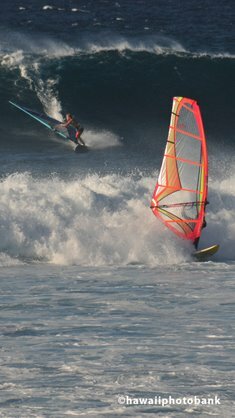 The other direction heads toward Spreckelville's secluded beaches and then to Kanaha Beach Park, where kiteboarders join windsurfers in a colorful show. Or, just kick back at Baldwin and enjoy the view of the West Maui Mountains. 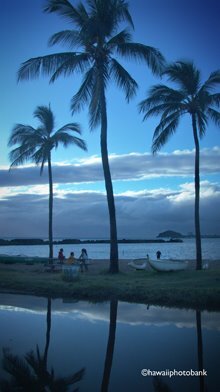 Windward Maui is not known for its beaches—Maui's west side is a run of beaches from Wailea and Kihei on the "Gold Coast," to Lahaina and Ka'anapali in the north. But these beaches are buffeted by a continuous run of condos and resorts. For the big slice of Hawaiian aloha, take a trip to Baldwin. 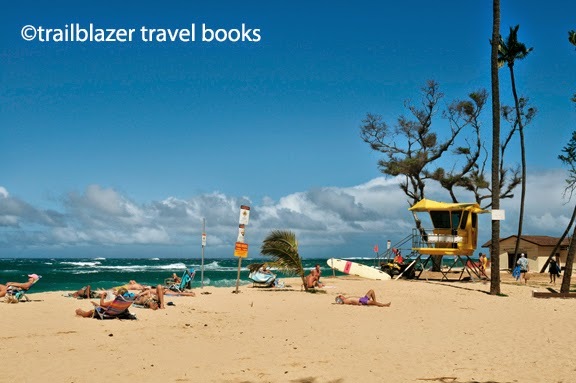 See Maui Trailblazer, pages 97-104 for more details. The subdued interiors of the Bishop Museum in Honolulu will soothe visitors who need a day off from scorching in the sun—and its vastly entertaining collection is a must-see for any fan of Hawaiian culture. The museum grew from the personal collection of Princess Bernice Pauahi Bishop, with many of the items handed down through the generations preceding the lifetime of her great-grandfather, King Kamehameha I. She was the Great One's last living descendent. The several-acre, campus-like grounds are anchored by the Hawaiian Hall, where the story of the Polynesian migrations to the Hawaiian homeland is depicted in detailed (but not overwhelming) exhibits along the open railings of a three-story grand hall. The open design is made intimate by artful lighting and objects hanging in the interior space (like a huge whale), a layout very similar to the museum of evolution at the Jardin des Plantes in Paris. The Hawaiian Hall is attached to the Polynesian Hall, a multi-roomed repository of esoterica from the many island nations of the South Pacific. Also in the mix are a Hawaiian Sports Hall of Fame, a museum devoted to changing exhibits, a Planetarium, and a gift store that matches any in Hawaii. Across the lawn is the fairly new (2006) Science Learning Center, which, in spite of the off-putting name, is a place where parents turn loose the kids to go nuts amid two-levels of spouting volcanoes, screeching jungle tunnels, and the splash of simulated waves. More details about Hawaii's best museum begin on page 68 of Oahu Trailblazer.